Headlight technology isn’t terribly complex, but there are a lot of different ways that headlights can fail. So if you find that your headlights have suddenly stopped working, it’s important to take note of the type of failure you’re dealing with and go from there. The troubleshooting process you follow will depend on the type of failure that you’re dealing with. With that in mind, it can be tremendously useful to start off by looking at whether both, or just one, of your headlights have failed, and whether or not the high or low beam mode still works. When headlights stop working, it's usually an electrical problem or an physical issue with the bulbs themselves. In order to get to the bottom of the situation as quickly as possible, it's important to make note of exactly what type of failure you have experienced. The cause: This is usually caused by a burned out bulb. The fix: Replace the bulb. If it still doesn't work, suspect a wiring or fuse problem. High intensity discharge (HID) headlights can also fail due to other associated components. Neither of the headlights work. The cause: Burned out bulbs, or an issue with power or ground. The fix: Check for power and ground, and fix if necessary. Otherwise, replace the bulbs. Bulbs usually don’t burn out together, but it’s still important to rule that out by checking for power. Most total headlight failures are caused by a bad component like a fuse, relay, or module. Wiring problems can also cause both headlights to stop working. High beam headlights don’t work or low beams don’t work. The cause: A burned out bulb, or a problem with the high beam switch or relay. The fix: Replace the bulb, switch, or relay. If just one bulb fails to work in either high beam mode or low beam mode, it may be the bulb. Most headlight failures that are limited to just high or low beams are related to a relay or the high beam control switch. Headlights work but seem dim. The cause: Foggy lenses, worn out bulbs, or a charging system issue. The fix: Clean the lenses, replace the bulbs, or repair the charging system. If your headlights always seem dim, the problem could be foggy lenses or worn out bulbs. If your headlights seem to dim during specific circumstances, there may be a charging system issue. 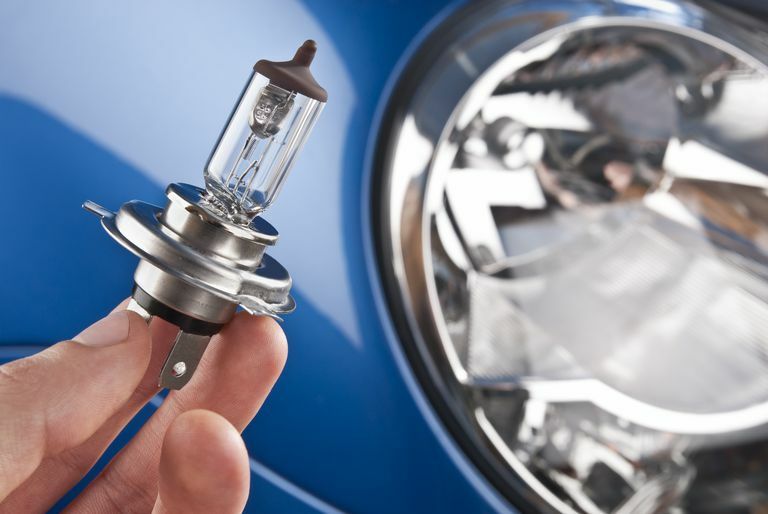 Other headlight problems are also caused by some combination of bad bulbs, wiring or relay problems, and bad switches. Most headlight systems are pretty straightforward and include a few basic components like the bulbs, a relay, a fuse, and a switch. There are variations on this basic theme, like some vehicles have daytime running lights, adaptive headlights, or other little wrinkles like fog lights, but the idea is still the same. When you turn on your headlights, that switch activates a relay. That relay, in turn, actually provides the electrical connection between your headlight bulbs and the battery. Fuses are also involved in order to provide a sacrificial failure point to protect the rest of the wiring. In the same way that your headlight switch activates a relay to provide power to the headlights, operating your high beam control will generally activate a relay to turn on the high beams. In the case of dual filament headlight capsules, this literally sends power to the high beam filament. If any of these components stop working properly, your headlights will fail. And by looking at the way they failed, you can usually backtrack to figure out the best place to start troubleshooting. Fix It Yourself or Take It to a Mechanic? Fixing a burned out headlight is usually a pretty easy job, but there are cases where you may want to go straight to a mechanic. If you don't own some basic tools and diagnostic equipment, like screwdrivers and a voltmeter, then you may want to think about taking your car to a professional during daylight hours. If you do take your car to a shop, they'll probably start with a visual inspection of the headlight system, check your fuses, and take a look at the switch and relays. Replacing a burned out headlight usually only takes a few minutes, but the diagnostic procedure could take between half an hour and an hour, or even more, if you're dealing with a more complicated problem. The diagnostic procedure that a professional technician will actually follow is similar to the one outlined below. So if you want to know more about what to expect when you take your car in to have your headlights fixed, you may want to read on. When one headlight stops working, and the other one works just fine, the problem is usually just a burned out bulb. Even though both of your headlight bulbs have been exposed to the exact same conditions, they usually won’t fail at exactly the same time. So it’s actually pretty common to have one bulb burn out before the other. Before you write off your headlight bulb as bad, it’s important to look at the electrical connector for any signs of damage or corrosion. If the connector has come loose, pushing it back on may fix the problem. However, you’ll still want to dig a little deeper to figure out why it came loose in the first place. Another factor to take into account before you replace a burnt out headlight capsule is whether or not there were any outside causes for the failure. Regular halogen capsules can last anywhere from 500 to 1,000 hours. So if yours didn’t last that long, there may be another issue at work. One easy thing to look for is any water or condensation inside the headlight assembly. If the seal is worn out or deteriorated, or the housing itself is cracked, water can easily get inside. When that happens, the operational lifespan of your headlight capsule will be severely compromised, and the only fix is to replace the headlight assembly. Traditional halogen headlight failures are usually pretty straightforward, but things can get more complicated when you're dealing with xenon or HID headlights. Although it is possible for an HID bulb to burn out, there are several other potential points of failure that you have to look at. The bulb may have burned out, or the problem could have to do with a bad ignitor or wiring issue. The easiest way to verify that your HID headlight capsule is bad is to carefully remove both bulbs and replace the one that doesn’t work with the one that does. If the known good bulb fails to turn on when placed in the other socket, then you’re dealing with a more complicated issue. It’s important to note that if you do swap the bulbs to rule out an ignitor or wiring harness issue, you need to avoid touching the glass envelope of the capsule. Any oils or other contaminants from your hands, or anywhere else, will greatly shorten the operational lifespan of the bulbs. If you aren't absolutely confident in your ability to swap the bulbs without contaminating the glass envelope, don't do it. You may destroy, or drastically shorten the life of, your good bulb. When both headlights stop working at the same time, the bulbs usually aren’t at fault. The main exception is when one headlight burns out first, goes unnoticed for some time, and then the other bulb also fails. If you suspect that the bulbs may be bad, and you own a voltmeter, you may want to start the troubleshooting procedure by checking for power at the headlights. The best way to do this is to turn the headlight switch on, connect the negative lead on your meter to a known good ground, and touch the positive lead to each headlight connector terminal. One of the terminals should show battery voltage, and the other two should show nothing, if the problem is burned out bulbs. You can then attempt to activate your high beams, which should result in a different terminal showing battery voltage. If this is the case, then replacing the bulbs should fix your problem. The first, and easiest, component to check is the headlight fuse. Depending on how your headlight circuit is set up, there may be one fuse or multiple fuses for the headlights. If you find a blown fuse, then replacing it may fix the problem. When replacing a blown headlight fuse, it’s important to use a new one with the same amperage rating. In the event that the new fuse blows, that indicates a problem elsewhere in the circuit, and substituting a higher amperage fuse could cause catastrophic damage. If you find that the fuse isn’t blown, then the next step is to check for power with a voltmeter. You should find battery voltage on both sides of the fuse. If you don’t, then you’ll need to look at the wiring between the fuse block and the battery. The next step is to locate and inspect the headlight relay. If you pull the relay and shake it, and you hear something rattling inside, then it has probably failed. Discoloration on the base or terminals may also indicate a problem. If you’re lucky, you will find that the same relay used in your headlight circuit is used in one or more other circuits. In that case, you can easily swap the headlight relay with an identical component. If the headlights start working at that point, then the relay was the problem. Beyond that, the diagnostic procedure is a little more complicated. In order to determine whether the relay or switch is bad, you would have to check if the relay receives power when the headlight switch is activated. If it doesn’t, then there is either a problem with the headlight switch or the wiring between the switch and the relay. If your vehicle has a headlight module, daytime running light module, or other similar component, then the diagnostic procedures can be even more complex. In those cases, the best course of action is to rule out everything other component first. Many of the same problems that can cause headlights to stop working altogether can also cause just the low or high beams to malfunction. If you find that just one bulb shuts off when you activate the high beams, but the other works just fine, then the high beam filament is probably burnt out in the first bulb. The same is true if one bulb works on high beams but now low. In most cases, the failure of high or low beams is due to a relay or switch problem, and the troubleshooting procedure is similar to the one outlined above. The difference is that some vehicles have a separate relay just for the high beams, and the high beam, passing, or dimmer switch may or may not be integrated into the headlight switch. If you locate the high beam relay and find that it doesn’t receive power when the high beam switch or dimmer switch is activated, then the problem is either in that switch or the wiring. In some cases, a loose stalk-type switch can cause this problem, although it’s more common to find that the switch has failed altogether. What Causes Headlights to Seem Dim? When headlights stop working, they generally stop working altogether. There are some situations where you may notice that your headlights don’t seem as bright as you expect, but the root cause may or may not actually be related to the headlights. If your headlights always seem dim, or they don’t seem to illuminate the road correctly, there are a handful of factors that could be at play. The first is that headlights actually do lose brightness as they age. So if it has been a long time since you replaced your headlights, a brand new set of bulbs may shine a light on your problem. Dirty, foggy, or oxidized headlight lenses can also cause an issue by blocking some of the light. Dirt is easy to see and clean, while foggy lenses usually indicates the intrusion of water into the headlight assemblies. While it is sometimes possible to drill a small hole into a headlight assembly to drain out water, doing so may not represent a permanent fix. In some cases, you will have to actually replace the headlight assembly. Oxidation of headlight lens covers can often be dealt with through reconditioning. This is a process that involves removing the oxidation with an abrasive and then applying a protective clear coat. If your headlights only seem dim when the engine is idling, and the brightness seems to change with the RPM, then the problem may have to do with the electrical system. The most common culprit is a bad alternator or a loose belt. If you find that your battery voltage is below 13V when the engine is running, then you’ll want to check out the charging system before you worry about the headlights. In some situations, you may find that the charging system is working just fine, but it still can’t keep up with the demands of the electrical system. This is usually due to the installation of power hungry aftermarket components, like a custom sound system with a powerful amplifier. When the charging system can’t keep up with the demands of aftermarket components like amplifiers, the dash lights and headlights are often the easiest sign to pick up on. If you notice the headlights or dash lights grow dim in time to your music, or when you’re stopped in traffic, then a stiffening cap or more powerful alternator may fix the problem.